Home Tags Posts tagged with "kim jong un new year speech"
In a New Year speech, North Korean leader Kim Jong-un has said a nuclear launch button is “always on my table” and warned the US it will never be able to start a war. However, he also offered a potential olive branch to South Korea, suggesting he was “open to dialogue”. Kim Jong-un also announced that North Korea may also send a team to the Winter Olympics in Seoul. President Trump was speaking at the sidelines of New Year’s Eve celebrations at his Mar-a-Lago resort in Florida. North Korea has come under increased criticism and sanctions over the past year because of its nuclear weapons program and repeated testing of conventional missiles. During the time, North Korea claimed to have a fully deployable nuclear weapon, though there is still some international skepticism about its true capacity to carry out such an attack. In his televised speech, Kim Jong-un re-emphasized his focus on the weapons program, but implied the country still has a few stages left to go before achieving its ambitions. 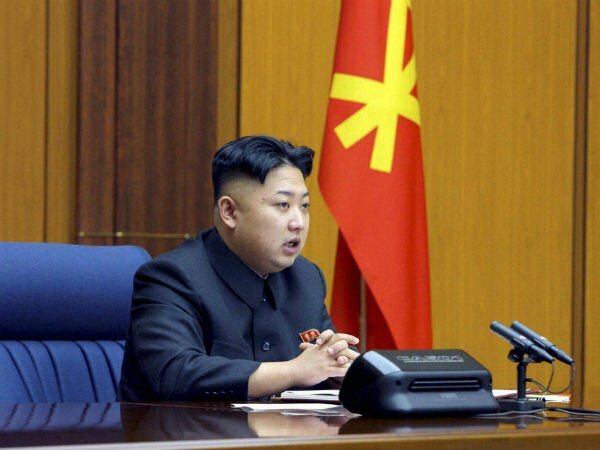 North Korea must “mass-produce nuclear warheads and ballistic missiles and speed up their deployment”, he said. Kin Jong-un also said they would not use their weapons unless they felt that peace was threatened. While his language against the United States remained tough, Kim Jong-un did not employ his typically antagonistic tone when speaking about his neighbors in South Korea. He said: “The year 2018 is a significant year for both the North and the South, with the North marking the 70th anniversary of its birth and the South hosting the Winter Olympics. A spokesperson for South Korean President Moon Hae-in said their office had “always stated our willingness to talk with North Korea at anytime and anywhere”. Kim Jong-un also said he would also consider sending a delegation to the Games in Pyeongchang, South Korea, in February – a gesture which South Korea has previously suggested would be welcome. “North Korea’s participation in the Winter Games will be a good opportunity to show unity of the people and we wish the Games will be a success,” he said. Lee Hee-beom, the president of the PyeongChang Games’ organizing committee, told South Korea’s news agency Yonhap he was delighted to hear of the potential participation. The only two North Korean athletes who qualified for the Games are figure skaters Ryom Tae-Ok and Kim Ju-Sik. Although North Korea has missed the official deadline to confirm their participation, the skaters could still compete with an invitation by the International Olympic Committee. South Korea’s President Moon Jae-in last month suggested delaying an annual joint military drill with US troops until after the Games. North Korea usually denounces any such exercises as a rehearsal for war.